COLAB is proud to announce that we are the only distributor in Belgium to offer the NEW ZYX Cartridges equipped with the brand new C-1000 Carbon Cantilever !!! 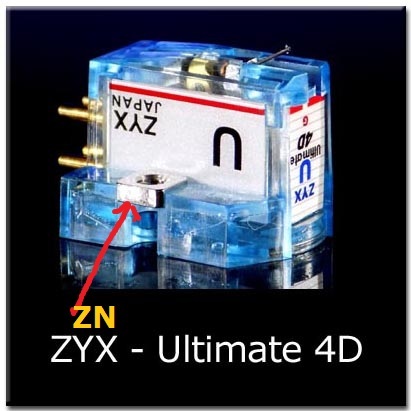 The ZYX Ultimate series (100, Airy, 4D, OMEGA and DYNAMIC) use a carbon cantilever for the very first time in a moving coil cartridge. The carbon rod is made from 1000 pieces of composite carbon fiber, hence the name “C-1000 carbon cantilever”. This composite carbon fiber is more rigid than aluminum, iron and titanium. In addition, its specific gravity is just half that of boron.Therefore we can be sure that the C-1000 carbon cantilever is the ultimate and ideal cantilever material for analogue record playback. The carbon cantilever gives us the widest frequency range and a superior tracking performance. A further major benefit is that the mechanical sound signal picked up at the stylus can travel through to the coil in a straight and direct fashion by way of the 1000 pieces of mechanical carbon lines. This ensures that reflected, repeated or modulated mechanical sound signals are completely absent.